Metropolitan Omaha Education Consortium pushed to reduce costs and the carbon footprint of their school bus fleet. They worked with contractor Student Transportation, Inc., for alternative fuel sources. Saving almost 50 percent per gallon on fuel costs compared to diesel. 42.6 million fewer pounds of carbon dioxide emitted over the lifetime of the fleet. 96 percent of school bus fleet operating on propane autogas. Omaha Public Schools aims to be one of the most energy- and resource-efficient school districts in the country. When school bus contractor Student Transportation, Inc. (STI) had the opportunity to bid on the Metropolitan Omaha Education Consortium (MOEC) school bus contract, STI focused their proposal on buses fueled by clean burning, economical propane autogas. MOEC includes both Omaha and Millard public schools. After securing the contract, STI ordered 435 Blue Bird Vision buses fueled by propane autogas to integrate into the Omaha area school fleet. The buses were put in operation for the 2013/2014 school year. STI’s drivers received training from ROUSH CleanTech where they learned how to properly operate the propane autogas school buses. For refueling, STI opted to install four propane autogas stations on their property. Although propane autogas has abundant public infrastructure in place, the private stations provide STI the convenience and ability to more closely monitor fuel usage. Installing a propane autogas station costs less than any other fueling option, including gasoline and diesel. And the cost to update an established refueling facility is minimal. STI’s local propane provider trained their designated fuel crew on refueling procedures. On average, a propane autogas school bus fuels at 8 gallons per minute. STI has reduced costs on routine maintenance since putting these buses into service. The design of the chassis and engine allows for more engine bay access for maintenance crews to perform routine upkeep. Regular filter and oil changes are less expensive compared to diesel, and propane autogas doesn’t require diesel exhaust filters. 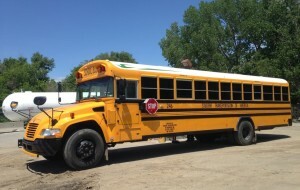 School buses fueled by propane autogas use about one-third the amount of oil when compared with a diesel bus engine. STI’s shop manager, Brian Urwin, says that the cost for interval maintenance for the propane autogas buses is around $25 in parts, compared to their diesel buses at about $90. Omaha typically has cold winters. STI’s diesel buses are started the night before, but STI doesn’t need a “start up crew” to warm up the propane autogas buses. This fact alone saves the school district more than $1,000 each cold weather day. Crews report that buses start up without issue and quickly produce heat. STI’s drivers remarked on the quick start up, quiet engine and smooth ride. Although drivers are trained to accelerate slowly to optimize fuel efficiently, many drivers are impressed by the “get up and go” that these propane autogas buses deliver. Urwin says the propane autogas engines run quieter than their diesel counterparts, making it much easier for drivers to hear emergency vehicles approaching and giving drivers fewer distractions. With 435 buses fueling with propane autogas at about $1.75 per gallon, and 20 buses fueling with diesel averaging $3.60 per gallon, Omaha and Millard schools are experiencing major fuel cost savings. Although diesel generates a couple additional miles per gallon, the gap in diesel and propane autogas pricing provides noticeable savings. STI contracted a “wholesale” price with their propane supplier. On average, propane autogas costs 30 to 40 percent less than gasoline and 50 percent less than diesel. The propane autogas buses travel between 100 to 150 miles per day for an average of about 50,000 miles each school day. In total, they’ve driven more than 3 million miles during the school year. MOEC and STI are saving nearly $5,000 per day by switching from diesel to propane autogas. Omaha’s “Green Schools Initiatives” supports and encourages environmental responsibility, recycling, consumption reduction and green living. Blue Bird buses equipped with ROUSH CleanTech propane autogas fuel systems reduce carbon monoxide, nitrogen oxide and total hydrocarbon emissions, and virtually eliminate particulate matter, when compared to conventionally fueled school buses. The buses meet stringent Environmental Protection Agency and California Air Resources Board certification standards and all federal motor vehicle safety standards. Since Omaha and Millard schools switched to autogas buses with STI one year ago, it is estimated that 4.2 million fewer pounds of carbon dioxide have been emitted into the atmosphere. Prince says STI is always looking for ways to reduce the two biggest costs for school bus fleets: wages and fuel. According to Prince, the company has lowered wages through less start up crews needed, as well as lowered fuel costs. Now, STI is working on maximizing fuel usage through collaboration with ROUSH CleanTech to develop integrated “fuel-savings” training. This training involves teaching the drivers proper acceleration and use of the gas pedal, and other tips and techniques that allow the buses to optimize fuel efficiently. ROUSH CleanTech is also creating an advanced calibration for the propane autogas engine that recognizes when buses are shifting to help maximize fuel efficiency. With 96 percent of its school buses running on propane autogas, Omaha is projected to become the first school system with a 100-percent propane autogas bus fleet. The remaining 20 diesel buses are rotated in as needed when the propane autogas buses are under maintenance. 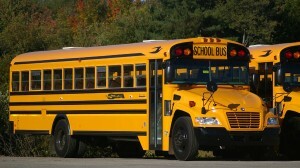 STI operates school buses for 165 school districts around the nation. Currently, more than 10 percent of STI’s existing 12,000-vehicle fleet operates on propane autogas, with plans for more.